The Iowa legislature is remaining mindful of the Revenue Estimating Committee’s two recent downward projections of state revenue growth. 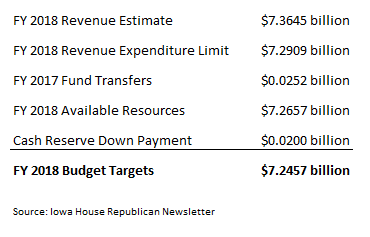 With the memories of this year’s painful de-appropriation process and large dip into the state’s “rainy-day” funds in mind, Republicans who control both the House and Senate released a joint budget target of $7.2457 billion for fiscal year 2018 this week. 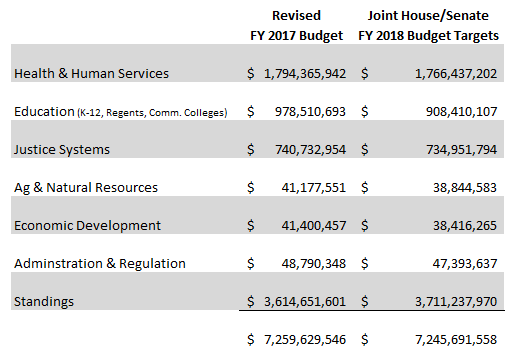 Though Governor Branstad released his own scaled-back budget target late last month, he quickly agreed to the legislature’s suggestion of an additional $38 million reduction. That is exactly what has happened to Iowa this year. Overly optimistic revenue projections and too much spending led to difficult mid-year de-appropriations and using money from the “rainy-day” funds. Both the Governor’s and Republican legislator’s budget proposals include refilling the $131 million used from Iowa’s cash reserves to cover fiscal year 2017’s overspending. The joint announcement from Sen. Schneider and Rep. Pat Grassley said, “This budget plan makes additional investments in key priorities like K-12 education and provides resources for essential functions of government.” Still included in the budget is an additional $40.1 million committed to earlier this year for K-12 education. “We don’t want to over-promise as done in the past. We want to make sure that when we set a budget number for education, it’s something that we can keep,” Schneider added. It is good for Iowa to use a cautious budgeting approach after receiving multiple inaccurate revenue projections. Too much spending led to difficult decisions and mid-year adjustments to our current budget. A responsible and realistic approach to next year’s spending is wise. Iowans for Tax Relief appreciates legislators fighting for the budgets’ of Iowans and not the budgets of state government.